Bio-Synergy launched into a competitive market place with well-known brands such as Weight Watchers and Cadbury already offering ‘diet’ mousses. 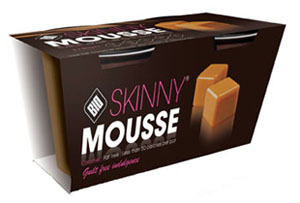 Bio-Synergy followed in their footsteps by naming its product ‘Skinny Mousse’. It’s in fact a well established health and wellness brand, targeting its offer at the sports and fitness sector. Surely there was a ripe opportunity to fill a gap in the desserts market by leveraging its brand heritage to bring the first ever functional and indulgent dessert to all those fitness people in need of a guilt-free treat with added benefits? It’s a shame they didn’t use their full brand name, “Bio-synergy”, and tap in to the equity built across the rest of their portfolio (drinks and sports supplements). Whilst the overall concept isn’t unique, the serious and sophisticated brand positioning is new for the ‘diet’ sector, and would have arguably made it stand out on shelf. But, when you dig beneath the surface, Bio-synergy had so much more they could have pulled out of the bag. They are low in carbohydrate, but fail to communicate the benefits, and they also have a magic ingredient called chromium, which is a naturally occurring amino acid which helps suppress sugar cravings. Wow! – now there’s a super benefit that would have given Weight Watchers a run for their money! It is not clear that Bio is the brand name, so consumers could be forgiven for thinking this product was offering similar benefits to bio-cultured yogurt, for example. There is also no obvious communication as to the extent of it’s “skinny-ness”, as simply stating “low fat”, “low sugar” is not very descriptive for the serious dieter or health fanatic. I was surprised to find out that the mousse has less than 80 calories, so how did that important little fact fail to be part of the brand proposition? Absolutely! 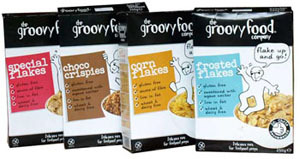 The Groovy Food Company is the first to marry functional and emotional benefits in “free from” food, and have made this especially relevant at breakfast time when we all need a happy start to the day! They are genuinely filling the ‘family and kids’ gluten free breakfast cereal gap that brands like Whole Earth, Rude Health and Nature’s Path haven’t yet unlocked. The brand has been around for a few years now, and is hopefully successfully borrowing equity from the nutritional oils and natural sweetener parts of it’s portfolio. They should have plenty of permission to play in a new category like cereals through demonstrating consistency in their brand promise, “delicious eats for feelgood peeps”. The brand positioning is what really sets this brand apart from the rest. It’s playful and down to earth, and not pretending to be too wholesome and virtuous. The ‘feelgood’ character on front of pack oozes the brands’ personality, and also has the potential to make the offer fun and engaging for kids. There is certainly no black magic at play here! It’s undisputedly a cereal that’s gluten, wheat and dairy free, full of other good stuff, and it looks like it will taste good too. Simple! Over recent years, the juice market has totally tapped the ‘superfruit’ trend – blueberries, acai, pomegranate, goji to name but a few. So, what new functional benefits could Pep’s Sea Buckthorn and Wild Berry offer the consumer? Or, perhaps it’s the ‘dry and refreshing’ taste profile that they thought would appeal to a new target? Pep appears to be just jumping on the ‘functional drink with natural ingredients bandwagon’. It’s a double strike for Pep, as it’s not only lacking credibility for the ingredients used in the drink, but it’s also a new brand, so it doesn’t have heritage or stature to trade from yet. I was interested to read that sea buckthorn berries are very popular in Scandanavia, a nation well-known for being ahead of the curve when it comes to eating a healthy diet. So is there a story here that could have helped give them a credibility boost? Upon deeper investigation, there is so much about this product that is unique, but failed to be communicated for some reason or other. It doesn’t always have to be the functional elements that pull you apart from your competition (flavour, nutritional benefits, ingredients), but don’t forget to bring the stories behind your products to life for the consumer, if they are relevant. In this case, there could be a provenance story – sea buckthorn berries are actually grown in the Himalayas, which has potential to give the range more esoteric appeal. Well, I know it’s a drink, but that is only thanks to it’s recognisable structure. Other than that, I’ve never heard of sea buckthorn and have no idea what it’s meant to do or taste like. When consumers see a new product and ingredient they need to instantly understand its benefits and be reassured on its taste. It’s so important, as a bare minimum, to reassure on the basic purchase drivers of your product.